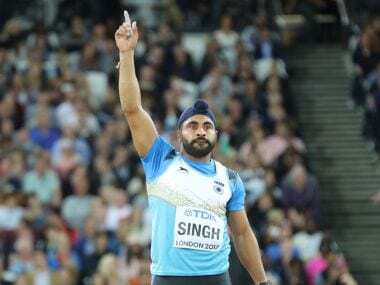 There are reports that triple jumper Arpinder Singh and shot putter Tajinderpal Singh Toor are training in Patiala rather than in the United States or New Zealand as envisioned by the Athletics Federation of India. This was part of its dream to locate India’s best athletes in the best possible training centres to record the improvement needed to be counted beyond Asian borders. There must be stronger reasons than just not getting to eat home-made food for Tajinderpal Singh Toor to return home after a brief stint in Auckland with renowned throws coach Didier Poppe. It is said that Arpinder Singh’s visa needed renewal and hence he had to interrupt his stint with Jeremy Fischer in the US Olympic Training Centre in Chula Vista, California. It does not need much research to know that, unlike in the past, it is not a question of athletes having to invest their own money. The TOP Scheme of the Ministry of Youth Affairs and Sports is available to the nation’s elite athletes. Earlier, a number of athletes drew from the National Sports Development Fund. Besides, a number of NGOs are now addressing their needs. At a recent press conference, you could sense a tone of anguish in the voice of Athletics Federation of India’s President Adille Sumariwalla when he spoke of how Sreeshankar was perhaps not giving himself the best chance to express himself as a long jumper. Deputy chief coach Radhakrishnan Nair echoed that by saying the decision to train in Palakkad would not benefit the youngster. Shooter Abhinav Bindra’s historic Olympic Games air rifle gold medal was mined during endless hours of training in Germany. His coach Lt Col JS Dhillon had taught him the basics in Chandigarh, but recognised that his ward would need a higher level of training if he were to successfully pursue his dream of doing well at the global stage. “It helped that Colonel Dhillon accepted that I needed extra expertise. It was another sign of his wisdom. Coaches otherwise tend to clutch on. It is hard to admit you have nothing more to teach or someone else knows more,” wrote Abhinav Bindra in his autobiography A Shot at History that documents his obsessive journey to the Olympic gold medal at Beijing 2008 and beyond. Then again, it is not as if all track and field athletes are averse to training overseas. Javelin thrower Neeraj Chopra trains in Finland or South Africa — with coach Uwe Hohn clearly expressing himself against training at NIS, Patiala — while discus thrower Seema Punia is training with a coach named Alexander somewhere in Russia. They are not the first to do this either. Back in the 50s and 60s, India’s leading athletes like Milkha Singh and Gurbachan Singh Randhawa spent several weeks away from home, training and competing in Europe. They were not confined to the Asian stage. They benefited from the cultural and sports exchange programmes with several European countries. It is important for all India’s track and field athletes to develop an attitude that can enable them to aim higher. And that can happen if such thinking is instilled in them at a very early stage of their lives. For, they find it hard to adapt to a new mindset that requires them to be away from familiar environment. They seem okay to be training in national camps, but fight shy of being overseas. Their thinking can be groomed by their own coaches. But one of the reasons coaches cling on to their trainees is a fear that they would miss out on the awards and rewards that come along with the athletes’ success. If this can be addressed to everyone’s satisfaction, it is just possible that we may find a few coaches not only willing to let go of their wards but also push them to aim higher. Indian coaches — and not just in track and field sport, but also in many other Olympic disciplines — and, as is evident in some cases, even parents, must learn to let go after helping their wards reach a level. If they really wish their athletes rise above the continental levels, they must facilitate their evolution by letting them train with better coaches and support staff. A change in mindset at the turn of the millennium helped India’s cricketers embrace new methods and maximise their potential. Unless this happens in a track and field sport also, India would continue to mark its presence in the Asian events and bring up numbers at the global level. Only when such a transformation comes along can India call itself an athletics nation.